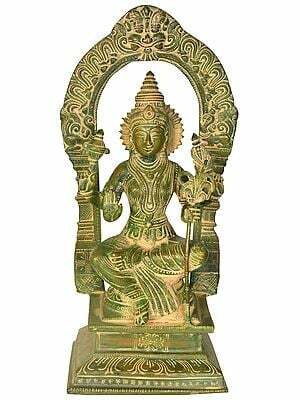 The devi Rajarajeshwari is known by the name Kamakshi down South where this exquisite bronze has been fashioned. In Sanskrit it means 'one possessing the eyes of love'. 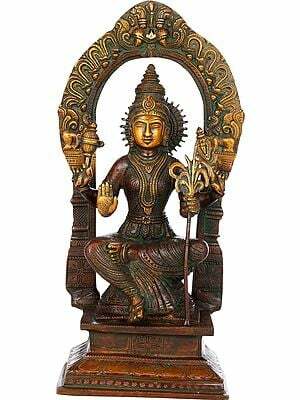 Her devotees find all the love and blessing they need in Her famous gaze, which is why none of Her four hands are in the popular abhaya or ashirvaad mudra. Her beauteous brow is set off by the sculpted length of Her sharp nose and the roseate lips where it ends. Her round full-cheeked face is complemented by the towering crown sitting on Her head, a typical characteristic of South Indian iconography. The sliver of moon attached to the same gives away her Shaivite lineage. 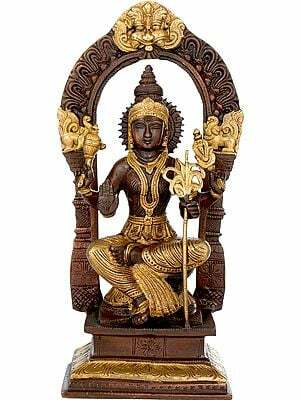 The ribbed halo, a relatively austere aspect of this particular portrayal, is in stark contrast to the gorgeousness of Her shringar - gigantic kundalas, chunky necpieces, and lots of bangles. In one of Her hands She holds the signature sugracane. 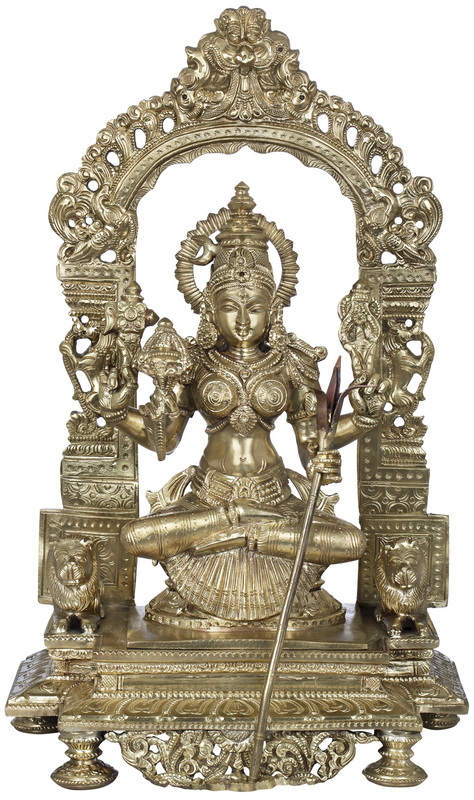 Unlike other female deities of the Hindu pantheon, Rajarajeshwari is sitting in moolbandha, the ample pleats of Her saree cascading down the inverted lotus pedestal. The composition is such as to be more than an icon. 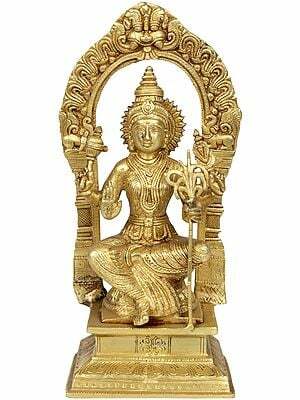 It is a portable temple of the devi. 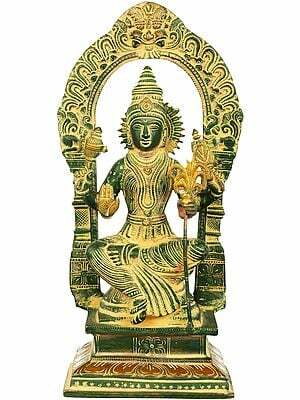 The inverted lotus She is sitting on is placed on a layered platform that is highly aesthetically appealing. She is flanked by a couple of lions that gaze straight ahead with the same stateliness as their mistress. The aureole that seemingly contains the composition is adorned with traditional faunal motifs such as horses, elephants, and peacock, not to mention the ferocious kirtimukha carved at the very top. The unusual, jawless kirtimukha motif recurs in Indian visual art since the fourth century, and stands for the cyclical and destructive nature of time. Equally ornate legs hold the complete bronze structure in place.